So, here we are, it's Friday evening, and I'm just finding the time to do my Feel Good Friday roundup. But, at least I'm doing it, so read along and then chime in with your own! I've had this ring for a long time. Until Tuesday, this ring had an opal in it. I should say that k-ster gave it to me, but technically, k-ster gave me a ring that I did not like and when I took it to the store, this is what I liked in exchange. Opal is my birthstone and I happen to think they are very pretty. My favorite part about this ring is that it is square. You don't see square opals very often. If I had a nickel for every time I've received a compliment on that ring, I probably could afford a diamond by now~! People tell me all the time that opals are very sensitive, they crack in the cold weather, blah blah blah. I have never taken this thing off and I've had it for about 10 years. I beat the odds. 2 years ago, as I was leaving the barn, I got into The General and the opal fell out, right into my hand. I marveled at the timing. Had it been 5 seconds earlier, it would have fallen on the dirt and that would have been the end of that. 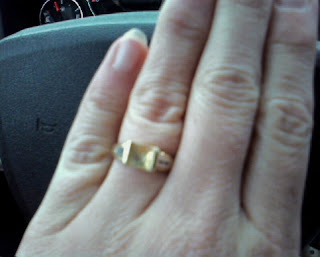 I took it to a jeweler who glued it back on and said it looked great for its age and that she was surprised that it was that old and had been worn non stop. A few months later, I took it to the same jewelry store to ask about resetting it in something with prongs and a different jeweler went nuts. She was like "we would NEVER touch an opal. We don't TOUCH opals" like they have diseases or something. That store has now closed after like 50 years, so go figure. I've looked at it a few times recently, thinking it looked strange, but it didn't seem loose. On Tuesday, I was in a rush, making copies, and I ran out of paper. I put two reams in and as I was taking my hand out from the second ream, I hit the ring on the tray and I heard a PING. I KNEW IT! I KNEW from the way I put my hand in there that would happen. After frantically searching the tray, I gave up and made my copies and went back to my room. I was sure it was in the tray, under some place that I couldn't see, so my plan was to ask the service guy to dismantle the machine the next time he comes. As I was leaving, I knew I had to search again, so I went back in with a flashlight. After laying flat out on the floor, looking under the copier, I looked inside the tray itself. The speckles in the stone caught the light and I found it!! Now I know I've got to reset it in something with prongs. Glue is not going to keep this thing in its place. I am currently wearing the ring without the stone, while I wait until I can find a jeweler who will touch opals. The ring itself is getting very thin on the band, so it's really time for me to do something. I'm just glad I found it! Now grab the button, go write about your feel good moments this week and tell us where to go! I've always heard how fragile opals are. So glad that you found it.